I admire moms who works and at takes care of their family especially the small kids at the same time. When they share how they were able to manage time working, fetching kids from school, doing household chores, taking care of the husband and a lot more. Moms are superheroes. I get inspirations and pickup lessons from my mommy friends and relatives. This Mother's Day why not give her something fashionable yet practical. Avon Philippines knows every women need - from makeup, intimate apparel to jewelries and accessories. Check out these Mother's Day gift ideas. 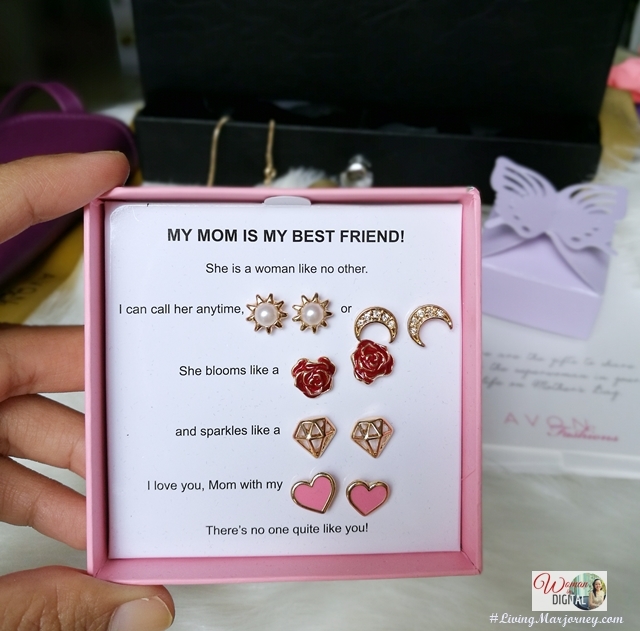 The Sweet Saying 5-piece imitation gold earring gift set is something that moms will appreciate for their quality & practical appeal. It comes in 5 accents - cream faux pearl, read and mint enamel, & round crystal acrylic. The Sweet Saying Charm Bracelet accented by ruby red, emerald green & sapphire blue acrylic crystals held together by a chain and other symbolic charms in imitation gold. Both sets are priced only at Php 399 each. To complete the special occasion surprise, Avon Fashions suggests a Jodi Stylish and Imari Seduction Purse Concentre gift set that costs only Php 599. The purple leatherette bag has a detachable strap to make it versatile as a sling bag or clutch bag. It comes with a handy Imari Seduction fragrance that moms can conveniently bring with them anywhere. You can also add a Chiara 3-piece ring and 2-piece earring gift set in a butterfly box, and the special Avon Fashions Mother's Day gift is ready to make moms feel giddy with all the attention. 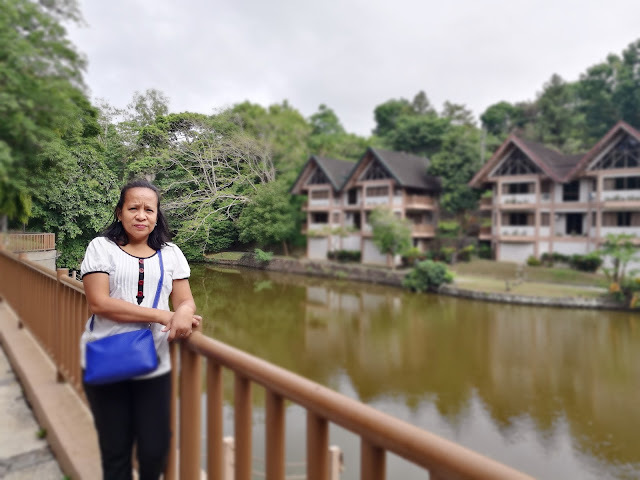 Mom wore the cream faux pearl earring while I wore the half moon design during our trip at Canyon Woods in Batangas. Call your Avon Representative and find out more about the brand. You may also visit, www.avon.ph or follow Avon Philippines on Facebook. For me, moms are the best persons in the world. I want to show my mom how much I care for her. Happy Mother's Day to all moms!